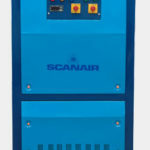 Scanair Glycol Chillers are latest in technology, engineered and designed for demanding process of glycol cooling applications that will maintain the temperature range from – 20oC To +30oC ± 1oC Capacity from 500 Kcal/Hr to 150000 Kcal/ Hr from 0.5 LPM To 120 LPM with different flow capacity. Glycol is used for cooling media over water because glycol is an antifreeze liquid and it can be cooled below water freezing temperatures without freezing which makes the cooling more effective. Another reason is that glycol acts as a lubricant for the chiller circulation pump and holds the temperature better than water. We have various glycol chillers and heat pumps to be introduced into the system to heat the glycol instead of cooling it. This can be very helpful in cold weather when you want the fermentation process to complete quickly. It is important to make sure that the correct mix of antifreeze fluid protection is put in the chiller for effective performance. 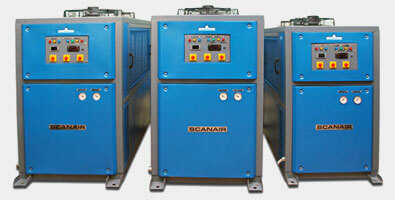 Scanair Glycol Chillers used in many applications for high medium and low temperature applications. The first is ethylene glycol(EG) is a colorless practically odorless, low volatile hygroscopic liquid that does not contain any foreign additives. EG is idea for re-circulation chillers and heaters, and it has good rust inhibitors. It can be diluted from 1-100% with water. EG is safe because can be used in industrial settings due to its relatively it has a high flash point. The second is propylene glycol(PG) which is a very good antifreeze and fluid heat transfer medium. PG is a good option for use in food and beverage applications because it is food grade and does not linger in the environment as it is biodegradable. PG provides freeze protection for the evaporator pumps and piping as well as rust prevention. 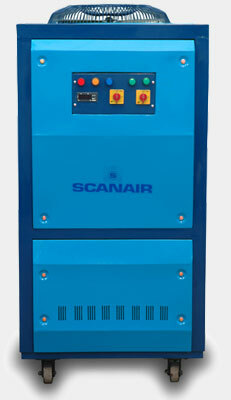 Scanair Chillers are used in batch processes quite frequently, in case of increasing capacity after installation. Many processors have loads that could fluctuate greatly over time dependent upon what product they need to produce. Few applications like pharmaceuticals, bakeries, concrete casting, cosmetics and food etc,. Chilling a batch of portable water to spray on vegetables minimize the risk from the bacterial growth on food products pre-chilled brine water spray on seafood or frozen food products. The acid solution used in anodizing and electroplating, electro polishing process. A batch can be cooled or heated with Plate Type Heat Exchanger or Titanium coils type that hang on the side of the process tank and immerse in the solution the tube or pipe coil. immersed in the tank distributed evenly throughout the bottom of the thank with glycol mix circulating through it provides equal distribution of heat and maintains constant batch temperature. Immersed tube coil are sometimes more difficult to install and could interfere with the process. The Titanium Plate Type Heat Exchangers are more efficient and sometimes easier to install because of the high turbulence created when the liquid is being pumped through the embossed plates will give good heat transfer efficiency.